Ava's garden nursery with her giant, toy giraffe watching over our baby girl sleeping in her crib. I made the pom poms in the cluster over our baby girl's bed and her grandma made the nursery window valance. I made many of the decorations used in Ava's pink and green garden nursery myself. I made the pom poms and then arranged them in a cluster above her crib so that my baby girl could see all the colours and textures. 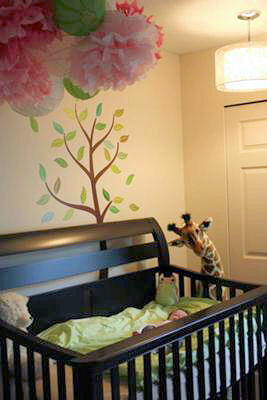 The tree that appears to be growing behind her crib is one of my favorite focal points in the space. Another outstanding feature is the giant giraffe that watches over my daughter as she sleeps. In the second photo of my baby girl's nursery, you will see the curtains that match Ava's baby bedding set that her grandma made for her. As natural decorations for Ava's pink and green garden nursery, she has an orchid by her window, tree branches with birds and more pom poms all over her walls. 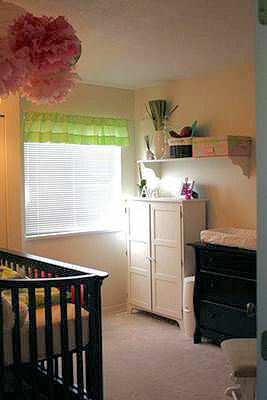 She and her baby garden nursery are not only pretty in pink, but pretty in light green too! Thanks for looking at Ava's garden nursery pictures!. I hope that you like how I put everything together and that the design will help other visitors that stop by Unique Baby Gear Ideas looking for advice. I saw your tutorial for the tissue paper pom poms on another page. Seeing them in Ava's nursery has convinced me that I need to print the instructions, buy tissue paper and get started! Really like the crib, is it a mini crib? Where did you get it or what brand is it?